You have arrived on an uncharted land mass riddled with great resources and great danger. It is up to you to tame this wild country and prove yourself as a god among men. Zeus has blessed you with his support, as have Artemis, Aphrodite and Athena, but this angered Hera and Hephaestus. Do not make an enemy of Bonersea. Absolutely enjoyable as a casual sandbox adventure! Played it through in bed on a sick morning, had a good time. Some things are just off, though - I don't know if it's just my game, but for example I couldn't summon Atalanta due to Artemis' sanctuary not being buildable. Fortunately I didn't need her to win, but still. Also I kept being given orichalc despite not, to my knowledge, being able to use it for anything. The adventure is balanced well enough; my rating is based off playing this as a casual sandbox, for which the balance and low difficulty works well. The rivals (such as Bonersea and Whoville, and I don't know if that's hilarious or childish or both, YMMV) posed no threat to me at all even in the first decade or so when I was being tormented by Talos, and most problems really can be solved by just waiting a year or so for money/resources to hoard up. It's a huge, open one-episode map with a bounty of resources and no story. 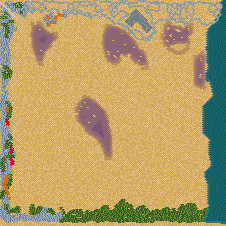 With that said, the huge, open, bountiful map gives you loads of freedom when building; this is slanted due to my building preferences, but I appreciate that in a sandbox. There really is none. The description in the original post is pretty much it. No instructions needed. Then, yet again, sandbox. Not too big of an issue. Like I said, a pretty good sandbox one-adventure map. No colonies, but I honestly don't know what they would add to the party; as far as I could tell on my playthrough, every resource is available in your city. It's one of those adventures where I didn't even look at the needs/exports of the other cities. Still, overall I had fun with it, and will be checking out other maps by Starfire!